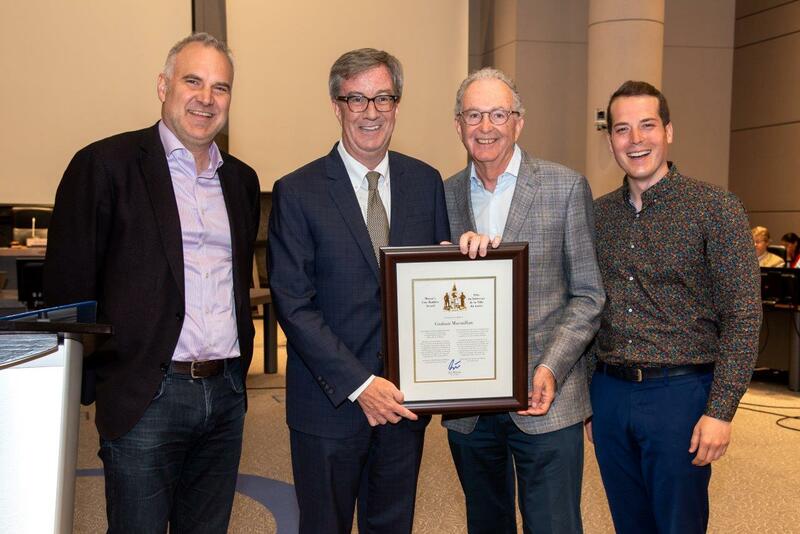 Mayor Jim Watson and Rideau-Rockcliffe Ward Councillor Tobi Nussbaum presented the Mayor’s City Builder Award to Graham Macmillan at City Council today in recognition of his dedication to the Boys and Girls Club of Ottawa (BGCO) and the Ottawa Senators Foundation. In 2017, Mr. Macmillan stepped down as board chair of the BGCO after a decade at the helm. The club grew dramatically under his leadership from an average of 10,000 visits and just over 2,600 members in 2009 to 114,000 visits and 4,500 members in 2016. While at the organization’s helm, Mr. Macmillan oversaw numerous capital campaigns to improve services, modernize program space and make the clubhouses more accessible for all residents. The BGCO is a key resource for children and youth in Ottawa. It offers after school, weekend and summer programs for kids aged 6 to 18 and provides them with opportunities for new experiences, confidence-building and social interaction in a safe and caring space. Mr. Macmillan also served as the Chair of the Ottawa Senators Foundation, aligning the organization with the BGCO. Mr. Macmillan continues to serve as a BGCO and Ottawa Senators Foundation board member today.